Saying No Makes Your Life Easier - Something New Everyday! There is a very simple, yet very critical time-management skill that usually is underestimated. 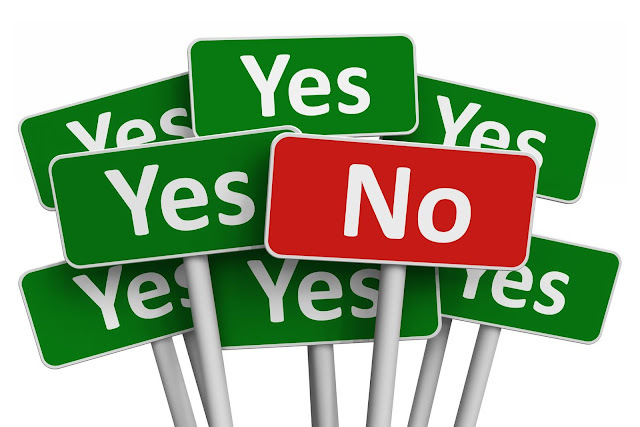 The skill is to saying no — primarily in your mind — and then to everything that is not really wanted. Sure there are a hundreds opportunities out there waiting for you to jump on them. There is so much information and advice waiting to get your attention. And of course, there are dozens of things on your to-do list waiting to get checked off. Your mind is also thinking at one time to do so many things at a time. Saying no in your mind doesn’t mean becoming ignorant. Instead saying no helps to purify your mind. It clears the fog and makes space for what is more important. Saying no means clarity. - When you are 100% certain that this is it. This is the thing I want to do - nothing else. It’s a beautiful situation to be in. It’s that kind of clarity that empowers you in every action you take. Now you don’t have to think and ponder and search for new ways. You just know your way, and you just go it. you also really know what you want. Otherwise, there would be confusion. 1. Is this urgent now? Time management often seems complicated. But at it’s core, it all comes down to this one single thing: You only want to spend your time on what is really important to you. This is the essence of clarity. For instance we have everything that you say is important, but it’s not. That means there is a tendency in all of us to rationalize things to be important, when in reality they are not. And when you’re faced with a lot of tasks that are not important, but seem pressing, urgent… then it’s finally time for you to say no to them. Imagine… if you could eliminate half of the tasks you have on your to-do list right now, by finally realising that these are actually not important to you. So ask yourself - 1. Is what I do right now having a long-term impact for reaching my goal? And 2. If yes, is this my #1 priority right now? This will make you clear and in less allotted time you will be able to do more priority work with full of satisfaction. Saying - No - Is Very Important to progress and enjoyment of life.